US Religion and Global Affairs Office Advisor speaks at European Jewish Association's Jewish Leaders Conference in Brussels. 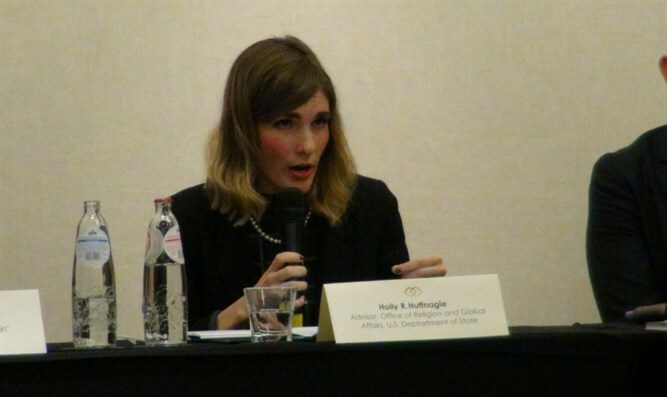 The US State Department Office of Religion and Global Affairs Advisor Holly Huffnagle spoke on Monday at the Jewish Leaders Conference of the European Jewish Association (EJE) which is taking place in Brussels. "Today, anti-Semitism extends across dozens of countries on different continents and takes many different forms," Huffnagle began. "We find anti-Semitism on the far left, the far right, and even in countries where there are no Jews. "Most religiously-motivated hate crimes take place against Jews in the US. Last November, the FBI released its hate crimes statistics report for 2015. 53.3% of religiously motivated hate crimes, so over 660 incidents, were directed at Jews who make up less than 2% of the American population. "Since 2014, the Report noted that crimes against Jews have increased by 9%....we've had multiple bomb threats to Jewish community centers and synagogues in the past two weeks, that have spanned 15 US states. "The State Department's mandate is to monitor and combat anti-Semitism abroad. But we are aware that most anti-Semitic attacks in the US, as in Europe, reportedly still come from far-right, white nationalist, and neo-Nazi groups. "There is a very real concern today of a current rise in far-right historically anti-Semitic parties in Europe... they now proclaim that they are pro-Israel, and therefore they are no longer anti-Semitic, or they can't be anti-Semitic. "We fear that these extreme right-wing parties are actually using their anti-Muslim platforms to gain Jewish support. So how will Jewish communities respond when these extreme right-wing parties reach out, extend friendship, and make political promises to them? "For a number of Jewish communities in Europe, this is a pressing question... We have to remember that all forms of ethnic and religious prejudices are direct threats to European values of tolerance and respect, and also to the very foundation of liberal democracies. "It's important that policy-makers resist this 'one size fits all' approach...anti-Semitism manifests itself in different ways in different regions. And it's crucial that we have an understanding of how anti-Semitism is, how it differs over time and from region to region, what factors fuel it, so that we're able to better counter and fight the problem. "Our number one priority has been to protect Jewish communities and Jewish lives, and on numerous occasions over the past several years, behind-the-scenes efforts by our embassies have helped enhance security for Jewish communities in very concrete ways. "We will continue to engage in bilateral and multilateral diplomacy, encouraging governments to appoint a special envoy to monitor and combat anti-Semitism...and to address and condemn anti-Semitic speech whenever we hear it. "Governments ought to strengthen and empower civil society to speak out against anti-Semitism. We find that civil society can build bridges and foster inclusivity in a matter that governments cannot. Increased success in monitoring and combating anti-Semitism is to a large degree based on building a robust multi-stakeholder coalition with civil society. "Is anti-Israel the new anti-Semitism? Well, our answer is: It depends...anti-Israel rhetoric can morph into anti-Semitism when it questions Israel's right to exist and targets Jewish communities outside of Israel. "Yet we are clear that criticism of Israel is not inherently anti-Semitic. Israel is a modern democratic nation-state and its policies can be criticized, like other states. And while understanding that sometimes criticism of Israel can indeed be anti-Semitism, we cannot lose focus on the other forms and sources of anti-Semitism today. "To more effectively combat anti-Semitism going forward in Europe, the Middle East, and in the Americas, we need to continue to share information and best practices...and strive to ensure that accusations of anti-Semitism are made judiciously, with maximum effect of protecting Jewish communities and promoting tolerance and mutual respect for diversity." Huffnagle also mentioned an Arutz Sheva op-ed titled "The Pope's Anti-Semitic Plan for Jerusalem" in which the author called on readers to boycott Pope Francis' visit to Jerusalem and called him "anti-Semitic" for supporting the two-state solution. "We must not immediately write off opposition to Israel's policies as anti-Semitism," she said.